I love to bake but when baking for two we can end up with far more dessert than we need or should eat. Sometimes I freeze part of it or with cookies, I will freeze most of the dough and just make a few at a time. Cheesecake is something I never make because it’s so rich we really don’t need a whole one for just two of us. It also can be a bit tricky and take a lot of time to make. In the past, I made no-bake cheesecake which helps with the work and time. 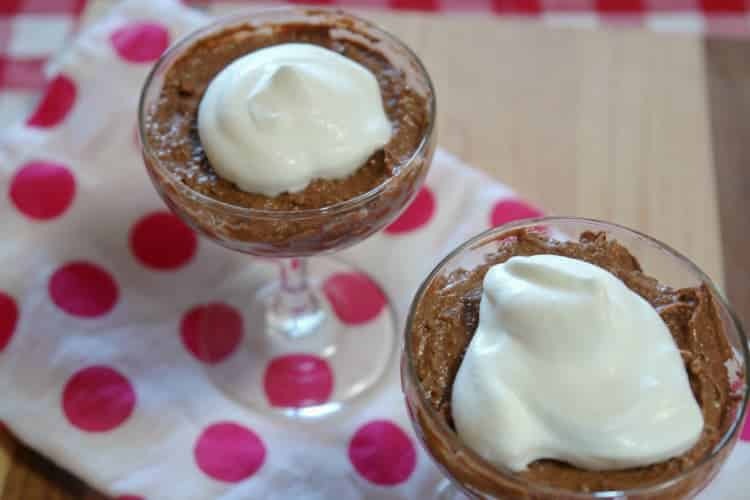 However, we still end up with too much and most recipes call for whipped topping which isn’t something I like to use because of the ingredients. I’ve also made mini cheesecakes that I could freeze but it takes a long time for just the two of us to go through them all. You don’t want them sitting in the freezer for too long. The perfect answer is a recipe that makes only two mini cheesecakes and is no-bake but with real ingredients. I have finally created a recipe that is delicious, easy and makes just enough for two people. It’s a great treat for Valentine’s Day or an at-home date night. This recipe is crustless so it’s great for anyone that is gluten-free and makes it even easier to make. You can easily make a crust if you’d like or simply place a cookie at the bottom of the dish. Simply crush some graham crackers and add just enough melted butter that you can pack the crust into your dish. 1. In a small bowl, beat on high, softened cream cheese until creamy. 2. In a second bowl, beat the whipping cream until soft peaks form. 3. 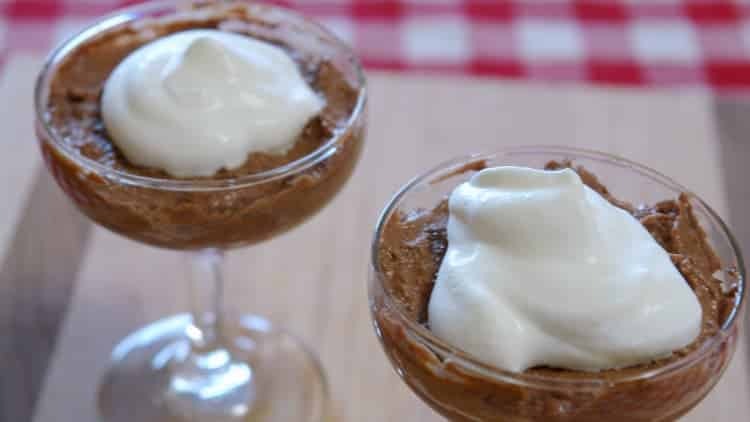 Sift powdered sugar and cocoa into the whipped cream and beat until combined. 4. Add the whipped cream to the cream cheese and beat on medium speed until combined. 5. Divide the mixture into two small dishes. 6. Cover and refrigerate for at least 4 hours. 7. Serve as is or with fruit, whipped cream, caramel, or any other topping you enjoy. I like to serve it with freshly whipped cream on top. Since the cheesecake itself is so sweet I don’t sweeten the whipped cream, it’s delicious as is. This is perfect to make the night before you want to serve it and only takes minutes to whip up. You can easily increase this recipe to serve more people. If you prefer plain cheesecake simply leave the cocoa powder out. It’s still delicious, especially with some fresh fruit on top. Looking for a quick and easy recipe for two? 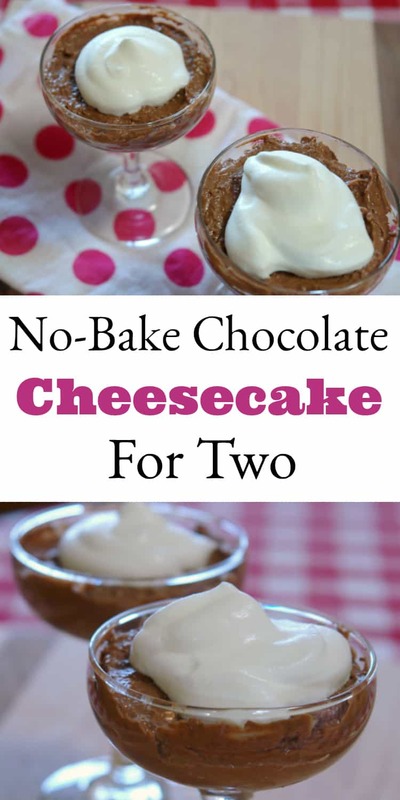 This no-bake chocolate cheesecake for two is perfect and easy to make. Great for Valentine's Day or date night. 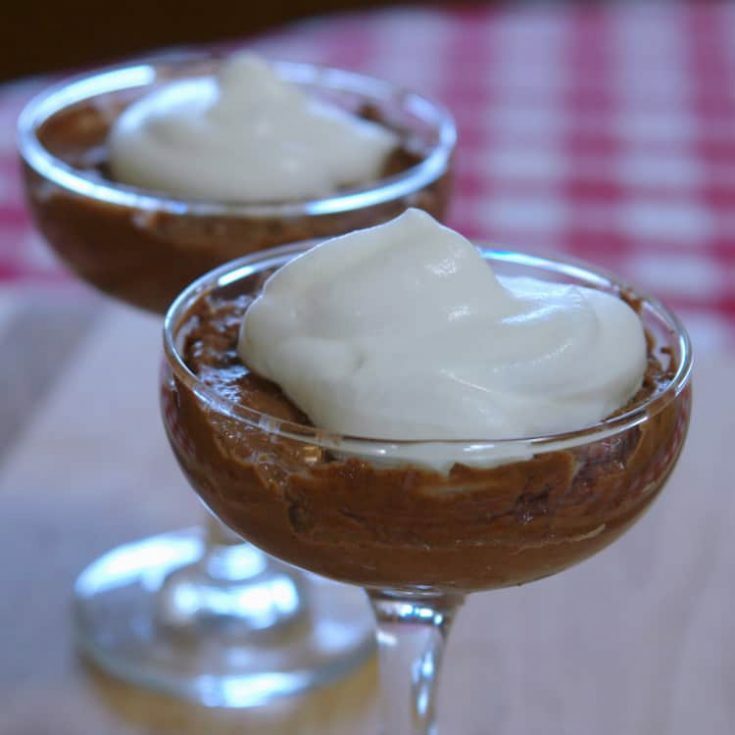 In a small bowl, beat on high, softened cream cheese until creamy. In a second bowl, beat the whipping cream until soft peaks form. 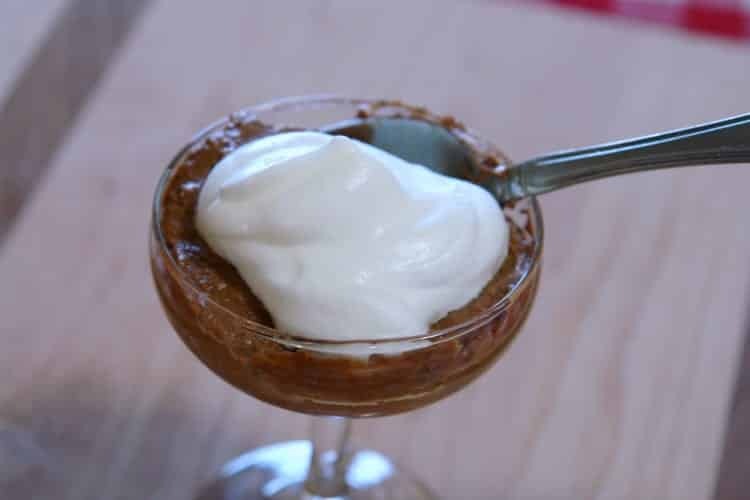 Sift powdered sugar and cocoa into the whipped cream and beat until combined. Add the whipped cream to the cream cheese and beat on medium speed until combined. Divide the mixture into two small dishes. Cover and refrigerate for at least 4 hours. Serve as is or with fruit, whipped cream, caramel, or any other topping you enjoy. Looking for more cheesecake recipes? Check out all of the wonderful ones here. And don’t forget to check out my other delicious recipes here on All She Cooks. Lisa Sharp is a housewife and blogger at Retro Housewife Goes Green. She blogs about homemaking, green living, frugal living, and vintage lifestyle.